Having attended this meeting last year, as well as in 1998, we were keen to return as our betting exploits had resulted in profits on both occasions. We combined the racing with two additional days’ holiday up in Laytown – an area we had enjoyed last summer whilst attending both the one and only beach meeting in Ireland and the Bellewstown Festival. We had booked a two-night package at Bettystown’s Neptune Beach Hotel, which overlooks the famous Laytown beach. Readers of my Bellewstown report will be surprised at this move, as I had been very critical of the price increases imposed during Summer 2001. At that time the price of a two-night package including breakfasts and one gourmet meal had increased to £175 IR p.p. Since the events of September 11 and the general threat of recession, the area north of Dublin suddenly looked very vulnerable, with its dependence on tourism, the high tech economy and airport employment. House prices in the area were falling quite significantly. Hotels were bound to suffer and the aforementioned package (albeit off-season) was now available at £90 IR p.p. This was good value for us as it equated to only £73 sterling. The gourmet four-course meal alone would cost you £35 IR if you were dining independently. The hotel has great facilities too – swimming pool, fitness centre and wonderful sea views. On Thursday night we listened to some excellent music at one of our old haunts in Drogheda – Mc Phails’ pub. Friday night we went to Drogheda’s Arts Centre for the first night of the “Traditional Music Weekend” which featured many excellent musicians I had never heard of. Saturday morning we checked out of the hotel and made our way cross country to Fairyhouse. The seven race card got underway at 12.30pm with a typical thirty-runner maiden hurdle. We played a couple of outsiders but it was the 6/4 favourite Ballyhampshire Boy who scooted clear. This former point-to-pointer could go on to better things. The third race was significant in that it featured the chasing debut of the ‘talker’ Youlneverwalkalone. We had made the mistake of being impressed with this one last year when he won the Hatton’s Grace Hurdle. Drifting from 2/5 to 4/6 he was beaten ten lengths by Topacio, in what looked a poor race. One to avoid. The racecourse then broadcasted the Hennessy live over the public address system. With screens all over the track showing the race, it was almost like you were there. What a tremendous finish! My friend Adrian was ecstatic as he’d backed the winner, What’s Up Boys. Next we were presented with two tricky handicaps. We drew a blank in both. Of the two remaining races, Yeoman’s Point initiated a double for JP McManus with an impressive victory. A fair performer on the flat, he could do well over hurdles. As for the betting- a very poor day! A short drive into Dublin to check-in at the Mespil Hotel. We thought we’d have a nice meal in town to compensate for our poor day’s punting. We went to the Fado at the Mansion House - opposite La Stampa. What a great choice this proved to be! I had the roast fillet of cod served on a wild mushroom risotto washed down with a Chilean chardonnay. Cod is the new salmon. Everywhere you go they want you to eat salmon. It’s over-farmed and quite often tasteless, whereas cod is becoming relatively scarce. When I was a child, living by the seaside, cod and monkfish were the family’s cheap and cheerful options with salmon and scampi too expensive for most. How times change. The Fado is highly recommended. It has a beautiful dinning room, very polite staff and unobtrusive live piano music. Sunday the quest for winners resumed. There was also the chance of seeing some top class horses in action. We nearly missed the first race as the crowd was at least twice the previous day’s, with long queues at the car park entrances. We backed Magical Lady in the first on the tote at 20/1+ – it was only 8/1 in the ring- but unfortunately she fell at the seventh. The next race gave us the opportunity to watch the highly regarded Like-A-Butterfly. Put in at 4/7 she maintained her unbeaten record by four lengths. Afterwards trainer Christy Roche expressed some concerns about her jumping but it all looked pretty impressive stuff to our amateur eyes! Race three and the start of the four-leg Jackpot. Yesterday’s tricky results had produced a £12k carryover to today’s pool. Time to get involved. I played 3x4x5x3 for 180 bets @ 50p. Fair start in the first as it goes to the second favourite (of six runners) at 7/2. 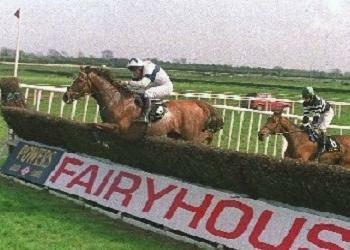 The next race was the Hatton’s Grace Hurdle. Limestone Lad taking on Ned Kelly and Liss A Paoraigh. I’d included these three plus Bannow Bay in my perm. The big money was down for Ned Kelly but after about ten yards of the race Limestone was fifteen lengths clear and stayed out in front for an all the way victory. The crowd went wild. Bannow Bay finished well, over this two and a half mile trip, and should be followed over three miles. The third leg of the Jackpot was a ridiculously difficult thirty-runner handicap. Incredibly I managed to pick first and second from my five choices. The winner - I’veHadit - was supported down to 5/1 favourite so plenty of punters had it too. Three chances in the sixth to land the Jackpot. Dans Dealer for a bag of sand (a grand) – led until three out; Canary Wharf for a monkey (collared run-in). And finally Davenport Milenium (sic) for £265.20, the eventual 5/4 winner- mustn’t be greedy! A winning return at last! Time to credit my tote account for yesterday’s losses. Overall a losing trip but plenty to look forward to at Cheltenham with eye catchers Ballyhampshire Boy, Bannow Bay, Davenport Milenium, Like-A-Butterfly, Limestone Lad and Yeoman’s Point.